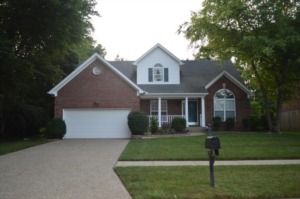 Beautiful, All-brick 1.5 story in Saddlebrook. This 4BR, 2.5BA homes is located at the dead end of a quiet street. Fantastic private, fenced backyard with large deck and inground salt-water pool. You will love the main floor master suite, first floor laundry, new carpet, cherry kitchen cabinets, and updated paint colors throughout. Basement ready for you to finish for an additional 950+ sqft. Mature landscaping and fantastic tree canopy adds to both beauty and privacy. Click to schedule your showing.